Looking to learn more? 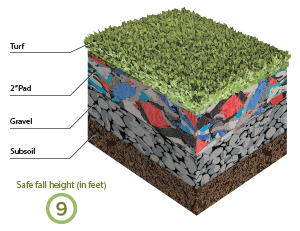 Here are some of the most frequently asked questions – and answers- that we get about our synthetic turf products and solutions. Infill is a fine sand or ground up rubber that goes within the blades of the turf. Infill helps support the fibers and provides bulk to the turf to weigh it down. The less dense the turf the more infill is required. Some products need just sand, some just rubber, some a combo, and some do not need any infill. How do you install infill after you install the turf? Brush the fibers so they are standing straight up. Spread infill evenly over the turf; It is best to use a drop seeder for this. Around 3 lbs. of infill should be used per square foot. While spreading the layers of infill, have someone use a broom to brush the infill into the fibers. The infill should be ¾ inches high, leaving ¼ inch of artificial grass sticking up. Do I need infill to make the grass stand up? If so, where do I get it? We always recommend using some kind of infill in all of our products. This helps protect the backing system from UV rays and provides ballast. Depending on the amount of filling used, this can also help the grass blades stand up more. We offer several types of filling and can help you determine what type and how much filling is needed for your specific project. 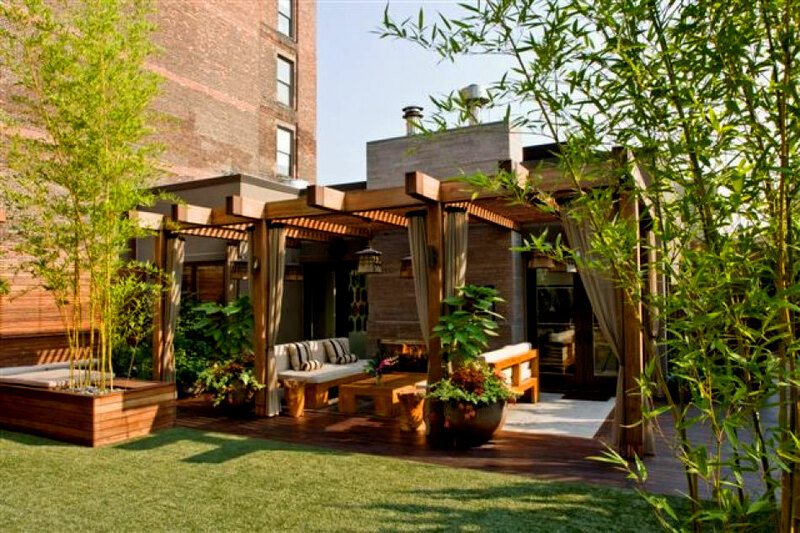 Can you put turf on a roof deck? Absolutely! Artificial grass is an easy, low cost, and low maintenance way to cover your deck. The green of the turf creates a beautiful and rich atmosphere, while adding a bare-foot friendly, durable, and stain resistant surface where the whole family can hang out. Artificial turf pricing varies by the type and size of the turf you desire. Our selection ranges from around $2.00-$5.00 per square foot. Please contact us directly to discuss prices. With that said, there are significant advantages of implementing an artificial surface in your yard. You will save considerable time and money through not having to water your grass, not having to pay for fertilizer, not having to mow the lawn and pay for gas, while having a beautiful and durable new lawn surface. What type of synthetic grass should I use for an area with multiple dogs? How can I control the odor? We offer a special pet application that utilizes an odor control top dressing. Our products are also created to properly drain. As long as all solid waste is cleared off of the surface any water or pet urine will seep through the porous turf and directly absorb into the ground, just like grass. Is it possible to install the turf myself? Absolutely! We share DIY videos on our website and YouTube channel to assist with your installation. This allows you to actually watch the video during the installation to ensure you do not miss any steps. We absolutely encourage you to watch the videos fully, where we mention specific details about the materials needed. You will need to arrange delivery of an aggregate or base material. You can discuss with our installers about which base material would work best for your specific project. You will need cutting tools, sand, nails, and seaming cloth/adhesive if you have any seams. Many specific installation tips are also mentioned below on this FAQs page. What do your recommend for cleaning and is turf easily cleaned? The best way to clean your putting green or synthetic lawn surface is to use a leaf blower to blow off debris. A nylon bristle with straight edges also works very well to rake up the fringe areas and remove leaves. To thoroughly rinse down areas we recommend using a chemical free cleaner, such as a combination of vinegar and water or Simple Green. If you have any stubborn areas that you are having trouble cleaning off, using a stiff broom and water can work wonders. Every few months you should sweep or brush the turf to ensure that the fibers stand up straight, which will maintain its appearance long term. Will turf burn your knees on rough contact? 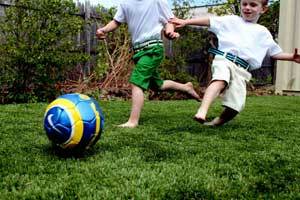 Our synthetic turf is nonabrasive, meaning you will not get any turf burn if you fall on it. Our product is frequently used in sports, including football, workout facilities, baseball, soccer, etc. All of our products are made from the highest quality materials and are 100% recyclable. Is there a minimum length when ordering your turf? There is no minimum length, but our standard width is 15’ (15’x_). At our location in Canton, MA, we have many pieces of various kinds of artificial grass from previous projects that range in size. These pieces are reduced in price and often work well for smaller projects. How does turf handle heavy snow or rain? Weather has an insignificant effect on our product and is not a problem. Our products are made to drain at a rate of 30 inches per hour. Which faux grass is the most realistic looking? We get asked this question quite frequently and the answer varies depending on who you ask. 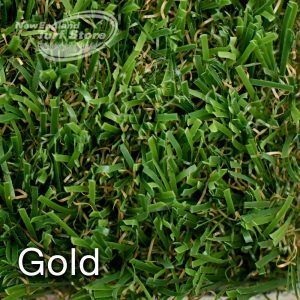 Our Turf Master Gold has consistently been our best seller due to its length, color, and overall appearance. Because this answer depends on who you ask, we strongly suggest you visit us or have one of our installers visit you so you have the opportunity to evaluate our many samples. How is artificial turf installed? We, at The New England Turf Store, have an experienced installation team ready to complete any project you have. It is also possible to install the turf yourself. We share in depth DIY videos on our website and YouTube channel to assist with any installation you want to do yourself. What is the life expectancy of artificial turf? When properly installed and maintained, turf can have a lasting life span. For example, our SYNLawn has a warranty of 15 years. In general, most outdoor artificial turf you can expect 10-15 years of use. For indoor, carpet-like turf, you should expect around 8-15 years of use. What do I do if a bubble develops underneath the turf? Do not ever cut or slit open the raised area or bubble. They are caused from solvents that are left in the adhesive or trapped under the surface during the lay-in process. It is best to use an ice pick or syringe to puncture the bubble and use your hands to press the gas out of the bubble. Allow the surface to readjust into the adhesive and sandbag or re-roll the area to maximize the bond strength. How do you prep the ground when installing outdoor artificial turf? Ensure the ground on which the turf will be laid on is firm and smooth. Be sure to remove and bumps, rocks, sticks, or any other debris. If you plan to install turf along the border of a patio or driveway, make sure the surface is 5 inches below its surroundings to account for the 4 inches of crushed rock base. How do you install a crushed rock base for outdoor artificial turf? When buying the rocks look for “1/4 inch minus compaction aggregate, road base, chat, or decomposed granite”. You will want around two tons of crushed rock per 100 square feet, which will create a 4-inch layer. Use a rake to spread the rock as evenly as possible. Use a vibratory plate compactor or another device to compact the rock. Soak the rock with water and then smooth and compact it again. This layer of rock allows the turf to quickly and properly drain. How do you prepare turf for outdoor installation? After you have laid down the turf and before cutting the edges to fit the area, ensure that all grains are running in the same direction. Make sure the lines/rows on the back are all aligned and you can use these lines/rows as a guide to cut straight edges. What does Face Weight refer to? The Face Weight represents the amount of material per square yard. The higher the number the denser and sturdier the turf is. How do you prepare the floor surface for indoor turf installation? The floor surface must be fully cured and washed to remove all excess chemicals used to form or cure the surface. It is essential to thoroughly clean the floor surface. Any dirt, paint, grease, oil, or other containments will prevent proper adhesion. How do you prepare the turf for indoor installation? Unroll the turf and allow it to relax for about an hour. The ideal environment for indoor turf is a temperature of 55 degrees Fahrenheit-95 degrees Fahrenheit and a humidity of 10%-65%. Precut the piece you are installing, but make sure to leave some excess material on the edges for proper seaming and edging. You can always trim the edges while installing. 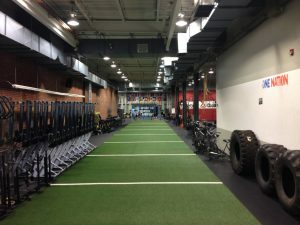 Do you have local artificial turf reps near me? We have multiple reps based in our Canton MA headquarters and we happily service all corners of New England. Please call 781-821-0112 to speak with one of our experienced New England Turf representatives to discuss the specifics of your artificial turf needs. What does the turf’s backing refer to? Backing is the material on the underside of the turf. One form of backing is called unitary, which is a thin, hard, and plastic material and is often perforated to promote drainage. The other form of baking, padding, is made from a foam material and provides cushion and a softer feel when walking on the turf. Padding varies in thickness, ranging from 5mm, 3mm, 5/8 in, to 3/8 in. What does the turf’s height refer to? The height represents the length of the individual turf blades. For carpet like turf, the height typically ranges from 1/4-3/4 inches. For grass like turf, the height typically ranges from 1-2 inches. What does the turf’s yarn type refer to? At the New England Turf Store, we offer several types of yarn. Most of our products are made from polyethylene, nylon, and monofilament. These yarn types vary in quality and durability so please call 781-821-0112 so our experts can match your needs with the right type of turf. How long does turf take to ship? Shipping time always depends on your location and whether you have a need to expedite shipping. Please call 781-821-0112 to discuss your specific situation. Turf spikes are used to secure outdoor turf surfaces to the sub-base. Turf spikes are around 6 inches long and are placed every 12-18 inches along the perimeter and seams. Most products we sell are made with a perforated backing, which allows them to properly drain any liquid. But, some of our short pile turf is not perforated and is unable to efficiently drain liquids so please contact us at 781-821-0112 to discuss your specific needs.